JNN 24 Jan 2014 QUETTA: Sit-in protests in Quetta and across Pakistan by the Shia Community Members in accordance with the families of Martyred pilgrims killed in the Mastung blast ended on Thursday Night after Federal Interior Minister Chaudhry Nisar and Information Minister Pervaiz Rasheed gave their complete assurance that a targeted Surgical Operation will be done very soon against the terrorist and the threat of terrorism and will be dealt with Iron Hand Jafria News reported on Thursday. Relatives , Friends and Shia Community Members of the 28 people Martyred in the blast had gone into 38th Hour of protest on Alamdar Road in Quetta, refusing to bury their dead unless the government give complete assurance and announces a targeted operation against perpetrators of the attack. The Interior and Information Ministers flew in to Quetta and assuring the protesters of government action against the criminals, persuaded them to end the protest. In response to a question about whether the government had a timeframe for the ‘action’, Nisar said there indeed is a timeframe. He then mentioned the meeting between top government officials and the Top Army Brass earlier on Thursday, where he said security matters were discussed extensively and the decision taken to put an immediate and complete stop to such attacks. Earlier, Chief Minister of Balochistan Dr Abdul Malik Baloch had visited Alamdar Road to express solidarity with the protesters last night. Promising better security for Hazara pilgrims on the Taftan-Quetta highway, Dr Malik said the provincial administration was considering the option of launching a ferry service. Despite assurances from the chief minister, the protesters called upon the federal government to take action against the groups stoking violence in the province. Later on Thursday, Federal Ministers Chaudhry Nisar Ali Khan and Pervez Rashid visited the Headquarters of the Army’s Southern Command, reported Radio Pakistan. During their visit, Commander Southern Command Lt. General Nasir Janjua briefed them about the security situation prevailing in Quetta. Protesting the Mastung killings and demanding justice, members of the Shia Community on a call given by Majlis-e-Wahdat-ul-Muslimeen (MWM) staged sit-ins in 10 different places in the city. The demonstrations were organised at Numaish Chowrangi, Rizvia Society , North Nazminabad ( Babul Ilm Imambargah), Ayesha Manzil (IRC) , Ancholi (Shahrah e Pakistan ) , Abbas Town , Sharah e Faisal ( Natha Khan Bridge ) Jafar-e-Tayyar, Gulistan-e-Johar and Malir. Traffic flow and flight schedule was disrupted due to the protests as many students, workers and flight crews could not reach their respective destinations. This also affected the movement in and out of the city as many flights failed to take off on time. Several passengers were stranded at the airport while some are staying in the nearby hotels. No special security measures were taken in the wake of these demonstrations to prevent untoward situations. Therefore, some Miscreants took the advantage of the situation and unidentified men torched a truck on Drigh Road and burnt a car near Shafiq Mor. The protests and blocked roads have led to traffic jams in Shah Faisal, Korangi, Gulshan-e-Iqbal, Gulberg and on MA Jinnah Road. The University of Karachi examinations scheduled for today were also postponed until further notice. Shia Protesters blocked the Faizabad interchange which connects Rawalpindi with Islamabad and demanded action against the perpetrators of the Mastung tragedy. The demonstrators were present in the area since last night despite the cold weather. Security personnel were deployed to ensure safety of the protesters, however, no government official has come to negotiate with the demonstrators. The blockade resulted in traffic jams in both the cities and people are facing difficulties in reaching their schools and offices. A large number of protesters staged a sit-in on the Mall Road outside the Governor House and have blocked the road since 6pm yesterday. Government and security officials negotiated with the protesters today and opened one side of the road for traffic. Apart from the major cities, solidarity demonstrations were also held in other parts of the country. MWM supporters staged sit-ins and blocked major routes near Sehwan, Dadu, Nawabshah, Tando Allahyar, Bhit Shah , Larkana, Jamshoro , Sukkur , Multan , Hyderabad , Faisalabad , Sialkot ,Badin and other Cities . A Protest by Shia Community Members in Birmingham , England was also registered as a Large Number of Persons staged a Protest infront of the Pakistani Consulate and also Presented a Memorandum to the Pakistani Consulate General . The banned terrorist organisation Lashkar-e-Jhangvi (LeJ) claimed responsibility for Tuesday’s attack, which it described as a suicide bombing, and warned of more such attacks. Last year, thousands of mourners staged a three-day sit-in from Jan 10 to 13 in the aftermath of twin-bombings that had left over 100 people dead. 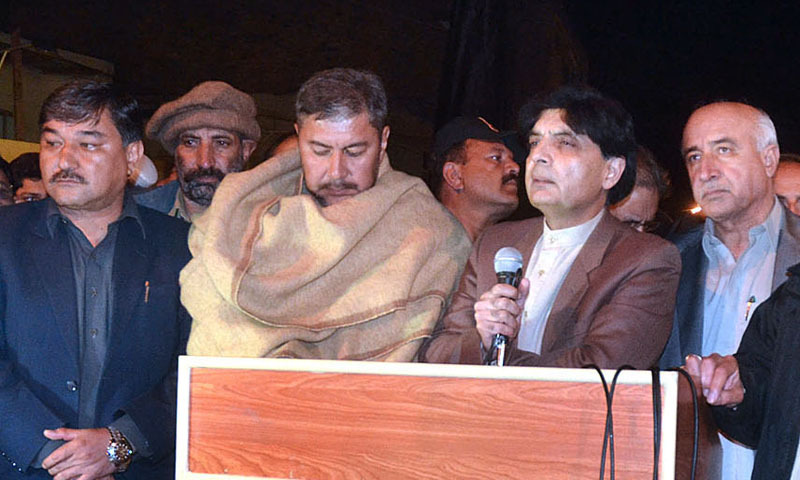 “We will bring the terrorists to book,” Chaudhary Nisar told a grief-stricken gathering of Shia Hazaras. He assured that terrorists would not be allowed to take law into their hands and that all out efforts would be made to restore the order in the province. “I stand by the Hazara community in this hour of grief and trial,” the interior minister stated. After almost 38 hours, the federal government succeeded in cajoling the angry protesters to end their sit-in. The protesters had brought 27 dead bodies of Mastung blast at Alamdar road to mourn their killing and press the authorities to launch a crack down against the perpetrators of the incident. “We announce to end the sit-in,” Abdul Khaliq Hazara, the chairman of Hazara Democratic Party told the gathering. Immediately after the announcement, relatives of the victims refused to bury the dead calling the assurances given by the government as hollow. Some of the enraged relatives came close to the stage and chanted full-throated slogans against the government. However, they also agreed to end the protest following reassurances from community elders and Shia leaders. Chief Minister Balochistan Dr Abdul Malik Baloch, Federal Information Minister Pervez Rashid and others also accompanied the federal minister. They held thorough negotiations with the members of Hazara community in order to convince them to end the protest. After successful negotiations, Abdul Khaliq Hazara said that the dead bodies would be buried at 10am on Friday morning. Following the decision taken in Quetta, Shia protesters across the country also ended their demonstrations. Earlier, assailing the federal government for being apathetic towards the protesters, the Majlis Wahdatul Muslimeen (MWM) had called for a countrywide strike on Friday, which has been taken back now. Police fired teargas shells and arrested around eight people to disperse the protesters staging one of the several sit-ins in Karachi. Leaders belonging to the Shia community condemned the incident that took place at Tower calling it a “cruel act by the police”. Sit-ins staged on different patches of the metropolis’ major artery Shahrah-e-Faisal had left residents of localities beyond the city’s airport almost stranded throughout the day. Shahrah-e-Pakistan that connects Karachi with other parts of the province through Super Highway was another affected area, compelling people from parts of the Federal B Area and Abul Hassan Ispahani Road to remain indoors, with all businesses almost closed. Due to the closure of main roads, traffic was suspended and flight schedules were also affected. This entry was posted in Asia Pacific, Pakistan News and tagged Chaudhry Nisar, Chaudhry Nisar Ali Khan, Dharna, Federal Information Minister Pervez Rashid, hazara, Lashkar-e-Jhangvi, pakistan, Protest Sit Ins, Protesters, Quetta, shia, shia community, Shia Community Members, SSP, taliban, Terrorism. Bookmark the permalink. The silence of pakistani politicians – apart from a few words condemning the blood bath – as they usually do – is deafening!Sending the rwo stooges to calm the situation means nothing- for tomorrow will be another day and further atrocities will be committed These shaheeds cannot speak for themselves, but the patience of their loved ones has reached a point , where it is becoming difficult to bear what they are going through.Lets be clear-patience does not mean weakness !Cursed are those politicians and supporters of these wahabi talibans- May Allah put them and their loved ones through the same fate as these shaheeds families.Doe this not deserve imran’s tsunami – or is he with them?